In the United States, government and educational sites are required to meet Section 508 requirements, and law suits demanding the same from corporations are already pending. The time for building smart, flexible sites is now. Building a site right means that your site will be accessible to the widest possible range of visitors—more visitors to hear your story, buy your product, and spread your name throughout the web. Our elegantly-coded sites meet best practice standards, are faster-loading for even those who don't have broadband, are usable for visitors with low or no vision, the colorblind—and others whose physical disabilities make the "simplest" site designs too challenging to use. All too often, web companies ignore these best practices, shutting out millions of potential visitors—and customers. More and more, sites are being read and used by a variety of tools, browsers, handheld devices, mobile phones, and best practices make the web, and your site, accessible to these visitors, too. Ignoring these "rules" can also make reading your site difficult for one of your biggest customers: search engines. Investing in accessible design, then, can directly and dramatically improve your bottom line. And, of course, making your site accessible is simply the right thing to do. Properly designed websites open the world and provide astounding abilities to those who simply want to engage in the ordinary activities of life, without help: Join in conversations despite being deaf, make a living even if they can't move their arms and legs, buy products or read product information even if they can't see, make friends or be loyal, enthusiastic customers even if they can't leave home, learn even if they can't go to grade school. The list of possibilities is endless. Now, too, the government is taking action, on behalf of those who have had enough of the frustration of dealing with utterly unnecessary barriers. Countries such as the United Kingdom, Canada, Australia, and the Netherlands all have mandates that sites must meet. In the United States, government and educational sites are required to meet Section 508 requirements, and law suits demanding the same from corporations are already pending. The time for building smart, flexible sites is now. The question, then, isn't if your site should be accessible—it's how accessible it should be. 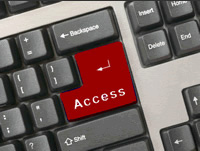 Each level of accessibility should remove more obstacles and make your site more usable. Every site we build covers the accessibility essentials, simply because we use clean, semantic markup; we separate style and structure; we label forms; provide alt attributes for images, among other things. Our normal practice is to create markup that will make your site more accessible for a wide range of "user agents," and, therefore, users. Does your site need to meet even stricter requirements? We can do that, too: sites that are fully 508 compliant, sites with Triple A ratings, sites with all the accessibility bells and whistles. We can evaluate your site, your needs, your visitors' needs, the legal requirements, and your budget, and define and implement the ideal plan. ©2009 W3Conversions LLC. All rights reserved.